4-Word Review: Misogynist cartoonist goes blind. 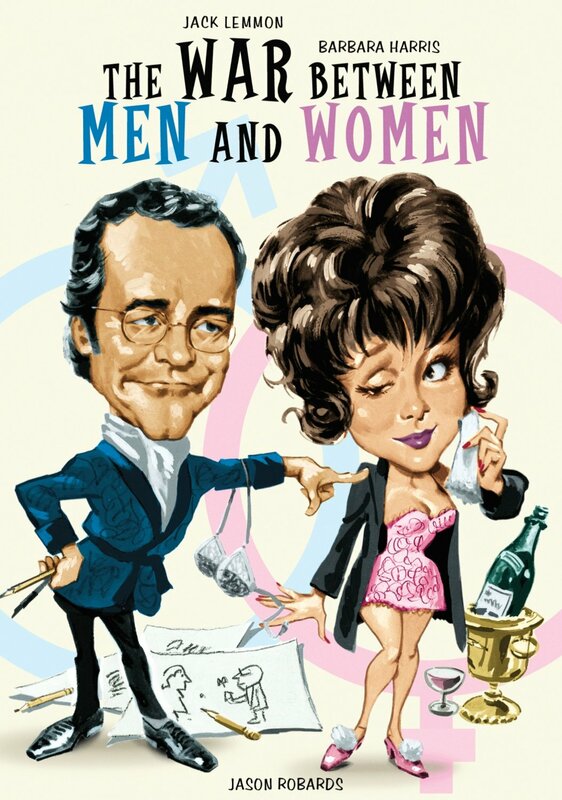 Peter Wilson (Jack Lemmon) is a popular cartoonist whose drawings depict women in disparaging ways. He enjoys his job and single lifestyle where he can live on his terms and keeps his apartment as messy as possible, which he usually does. However, his already poor eyesight gets worse and upon a recent visit to his optometrist (Severn Darden) he finds that he must get an operation to help save it and even then there is a fifty percent chance that he could still go blind. Despondent and depressed he meets Theresa (Barbara Harris) a single mother with issues of her own. 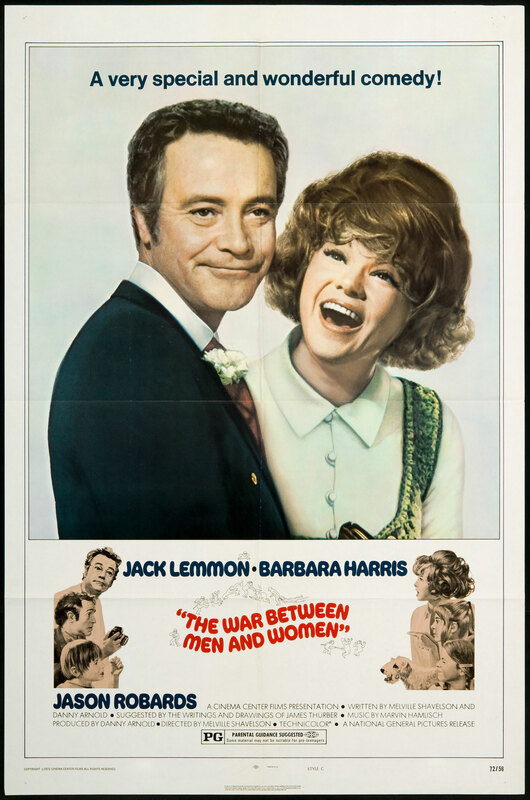 The two enter into a whirlwind romance that quickly leads to marriage only to have Theresa’s ex-husband Stephen (Jason Robards) show up at the wedding and wanting to rekindle their relationship. Peter’s character is loosely based on James Thurber and the film itself is a distant cousin to the TV-series ‘My World and Welcome to it’ that aired for one year on NBC during the 1969-70 season. The film though doesn’t have enough of Thurber’s whimsical humor to make it worth watching. It starts off with some potential as it opens with a weird animated segment and drawings that closely resembled Thurber’s, but then quickly devolves into a contrived comedy/romance with maudlin drama thrown in that makes it seem like two movies in one. Had it stuck with the animation it would’ve done better, but even that gets kind of stupid including one segment where Peter’s drawings start to attack him, which forces the humans to stage an all-out war between them and the cartoon characters. Peter’s acerbic, woman hating personality is initially diverting, but then for no reason he does a 180-degree turn by falling in-love with Theresa almost immediately and becoming a conventional husband and father while turning the film into a silly version of ‘The Brady Bunch’. I also couldn’t understand why Theresa would fall so head-over-heels for Peter as the two are trading barbs one second and then in bed together the next making their character’s motivations quite confusing. Robards, who has his hair dyed dark brown and is almost unrecognizable, gets stuck with a thankless supporting role and is seen only briefly. Initially his presence had some potential as he starts to become buddies with Peter and plot against Theresa, but then his character dies unexpectedly making it confusing why he had been written-in in the first place. Lisa Gerritsen, who is best known for playing Cloris Leachman’s daughter in the ‘Mary Tyler Moore Show’ TV-show and the subsequent spin-off ‘Phyllis’ has some appealing moments, but her constant stammering becomes annoying. Thurber’s wit was unique and legendary, but this film is too timid to dive completely into it. I suppose the idea of having an openly misogynistic protagonist was considered ‘too edgy’ for early 70’s cinema, so attempts were made to make the character more mainstream, but in the process creates a film that is disjointed and bland.